I desperately needed some Preserved Lemon when I made my Turkey B’Steeya the other day – and had none on hand, nor did I have a clue as to where I could find some. A search ensued, on the internet, because I knew from time to time I’d seen “quick” preserved lemon recipes. Of course, quick is relative here, but rather than waiting for weeks for the salt to work on the lemons in the time honored method, the quick version relies on the lemons going into a very slow oven for two to three hours. Luckily, this is mostly hands-off time, just a stir now and then. I can be a bit of a purist and admittedly a bit of a food snob from time to time and frankly, I like a jar of preserved lemons on my back counter, working away. I really couldn’t tell the difference, though! I did look at a lot of different recipes and came up with a basic formula: A tablespoon of salt per lemon. Also, thin skinned lemons are better, if you can find them, and the amount of time varies with how the lemons are cut. Chopped or sliced across seems to work in about two hours, a pole to pole slice in about three. The lemons need to be thoroughly scrubbed if they are coated in wax. I found dropping them in a bowl with one part vinegar to 3 parts water and dipping my scrub brush into the water as I used it made it a bit easier. 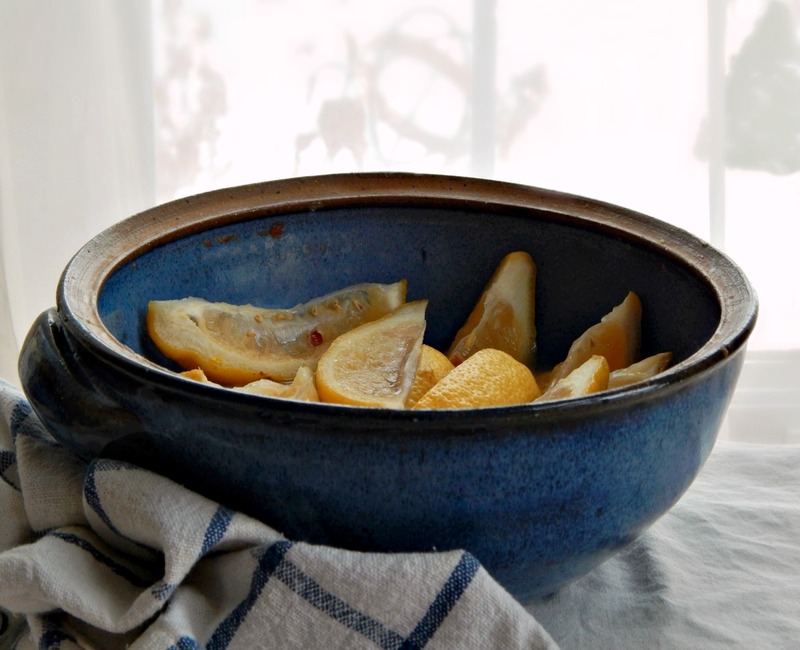 To prepare lemons, scrub skin until no wax remains. Placing them in a bowl filled with a mixture of one part vinegar to 3 parts water and dipping your brush into the mixture as you scrub is helpful. In a small baking dish or casserole, add lemons and toss with salt. Add lemon juice and bake, covered, stirring now and then until the skins are softened, about 3 hours. Let cool and transfer, with juices, to an airtight container. The preserved lemons keep indefinitely. As an additional safety measure, keep refrigerated. Note: If you’d like to make a quicker preserved lemon, slice lemons across or chop and continue with the recipe as directed. The smaller pieces will require less cooking time. This entry was posted in Click here for Fabulous Food Posts and tagged Condiments, Easy Recipe, Frugal Hausfrau, Heritage Recipe, Lemon, Moroccan, Preserved Lemon. Bookmark the permalink. Great post – I didn’t realise there was fast track process for preserved lemons! By thin skinned do you mean Meyer lemons? Thanks for the shortcut! To tell the truth, I’m not sure! I know sometimes at the store in the bins, we have thicker skinned lemons, like the ones I ended up using (didn’t get quite as soft) and other times they’re thinner – but I bet Meyers would work absolutely perfectly. Really interesting post! I had never heard of this method of preserving lemons. That’s what I love about blogging and following other bloggers. I learn so much! Thank you. I know, I feel the same way! Happy Thanksgiving to you, too, although I’m weeks late to be wishing you that!